HTML by John A. McNulty, Ph.D. 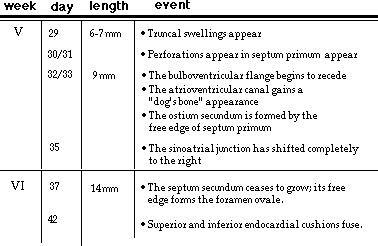 The primordium of the heart forms in the cardiogenic plate located at the cranial end of the embryo. Angiogenic cell clusters which lie in a horse-shoe shape configuration in the plate coalesce to form two endocardial tubes. 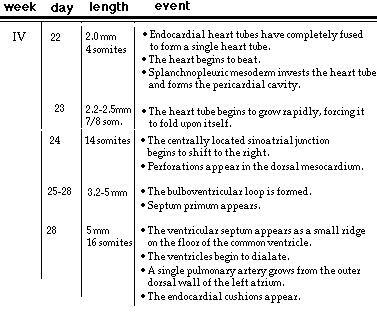 These tubes are then forced into the thoracic region due to cephalic and lateral foldings where they fuse together forming a single endocardial tube. The tube can be subdivided into primordial heart chambers starting caudally at the inflow end: the sinus venosus, primitive atria, ventricle, and bulbus cordis. The heart tube begins to grow rapidly forcing it to bend upon itself. The result is the bulboventricular loop. Septa begin to grow in the atria, ventricle and bulbus cordis to form right and left atria, right and left ventricles and two great vessels- the pulmonary artery and the aorta. By the end of the eighth week partitioning is completed and the fetal heart has formed. You may wish to view the timetable of events for Week 3, Week 4, Weeks 5-6, and Weeks 7-8 and keep these images open while you proceed through the lesson.